The Crown fountain was the brainchild of Spanish artist Jaume Plensa. The fountain is part of Millennium Park which is a focal point in downtown Chicago. The area houses several massive public works including the Fountain, the Cloud Gate and the Frank Gehry designed symphony pavilion. Describing all the aspects of the fountain and the process of building it would fill a book, but I will try to distill it down. There are two 60' glass block towers that have HD video screens inside them. The towers face each other across a very shallow reflecting pool. The screens show any one of 1000 Chicago citizens face for about 2:00. The mouth then opens and water shoots out into the reflecting pool and at the opposing face. The faces fade off and a cascade of water crashes down from the top. The 1000 faces represent the global racial population of the city. Many hundreds of hands and minds were involved in bringing Jaume Plensa's vision into reality. My roles were as a artistic and technical consultant to Mr Plensa along with project lead John Manning. There were almost 100 steps to figure out in the process of taking a face from HD video to being ready for display. After the design phase I was the "color corrector". Jaume has a particular way he wanted the faces to look and my job was to balance the color of every race of human and correct any lighting or other differences that arose out of filming over a period of months. John Manning and I also traveled around the Midwest filming meditative water scenes to play as an occasional break in the sequence of faces. The final prize and surprise of the project was to find that a day or two after it was opened, thousands of Chicagoans were donning swimsuits and standing under the spray of water to cool off in the hot Summer. Each disc is comprised of organically animated scenes comprised of landscapes, temples, doorways and lost symbols. to visualize the interior essence more than just the way it looks. These projects are done as solo work with the exception of the music composition which is handled by Fritz Heede or Michael Stearns. notoriginally recognize, so our daily conversations often push the work into a new place. 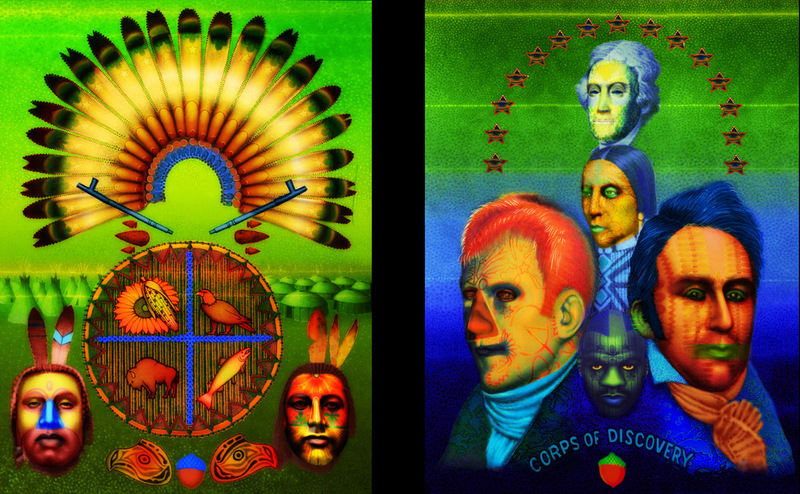 I was lucky to be part of a small team that was put together by Ed Paschke's son, Marc to finish his last two paintings. The unfinished work dealt with the journey of Lewis and Clark. Ed had passed away after completing only the drawing stage of two massive 7'x9' canvases. Our goal was to try to find a way to do the work justice and present some concept of a finished form. It was decided to digitally reimagine the images and leave the original canvases untouched. Marc Paschke and John Manning filled my head with hundreds of Ed Paschke paintings that spanned his long career. We also spoke at length with his studio assistant and close friends about his methods and intentions. It was finally decided to create a series of possibilities instead of one work. 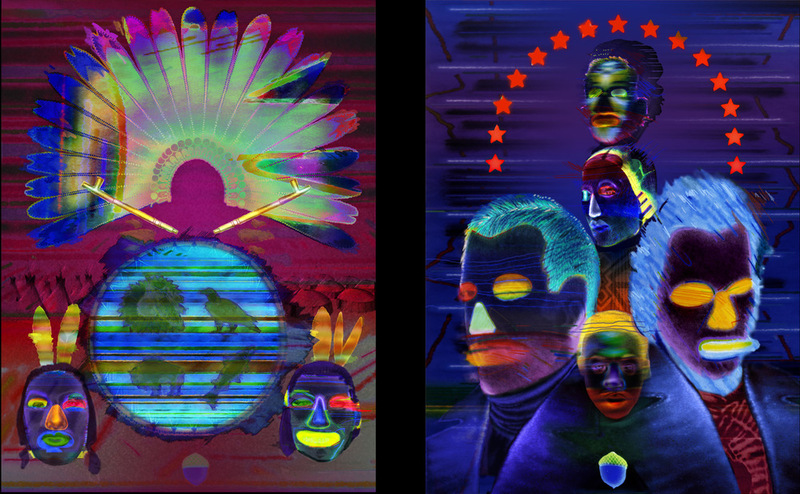 I created three sets of milestone images to mark three major periods in Paschke's development. These scenes were a combination of digitally hand drawn and layered pieces of Paschke's other paintings. Kind of a patchwork quilt approach. Once we had the central images, I set about creating an animated series of changes that followed his styles and the idea of the river that Lewis and Clark traversed. The animation was rendered in HD as two separate scenes that were vertically oriented on the largest plasma screens we could find and placed side by side on the wall. The work was originally part of a retrospective at the Chicago History Museum and then moved to a permanent home at Lewis and Clark College. The WOW disc is another one of those complex and hard to describe projects, but I will give it my best shot. The main WOW disc was created to allow consumers to maximize their home theater experience by learning about High Definition, by calibrating their equipment and then having access to great images to entertain and enjoy the fruits of their labors. My roles were as associate producer, writer and producer of the HD Primer educational material, lead designer and information architecture and other odds and ends. I shot all the HD material for the HD primer and several comparison tests as well as generating the CG scenes for all the menus. The disc has many Disney/Pixar clips from Wall.e, UP, Toy Story and others. There is a second companion disc called Visions. This is a series of HD ambient loops of nature scenes for enjoyment and for checking the calibration. I created and animated all the pieces on this disc. Several of the scenes were not video but entirely CG creations utilizing Vue 3D. One piece was shot with the Canon D7 DSLR and the rest were mostly XDcam EX or HDcam. This was a very complex production with many different players and assets being created all over the country. The approval process was exceptionally stringent as we were presenting a lot of detailed technical concepts that are not well understood and we were representing such a major brand in Disney.